Jason Babin had seven sacks for the Jaguars last season. 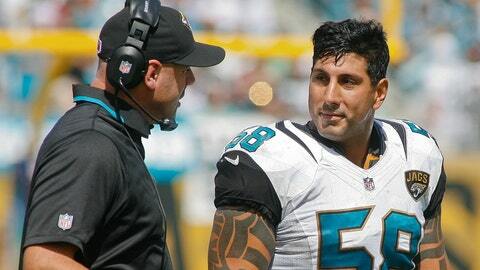 In a move that was not totally unexpected, Jacksonville Jaguars defensive end Jason Babin voided the final two years of his contract Monday to become a free agent, according to multiple reports. Babin started all 16 games last season and led the Jaguars with 7.5 sacks. But he’ll turn 34 in May, and he was scheduled to make $6.175 million in each of the final two years of his contract. One report said Babin, who had 18 sacks in 2011 while a member of the Philadelphia Eagles, declined a pay cut to stay with the Jaguars. The move could mean the Jaguars will make it a high priority to sign one of several pass-rushing defensive ends available when the NFL’s free agency period commences Tuesday at 4 p.m. They made a move over the weekend to bolster their defense against the run by signing end Red Bryant, formerly of the Seattle Seahawks. The Jaguars also have the third pick in the draft May 8, and several mock drafts have them selecting Jadeveon Clowney of South Carolina.